For other uses, see Eaves (disambiguation). The eaves are the edges of the roof which overhang the face of a wall and, normally, project beyond the side of a building. The eaves form an overhang to throw water clear of the walls and may be highly decorated as part of an architectural style, such as the Chinese dougong bracket systems. Eaves is derived from Old English efes meaning edge. According to the Oxford English Dictionary, eaves is both the singular and plural form of the word. However, the Merriam-Webster website lists the word as eave and states that it is "usually used in plural". The word was used before the 12th century in the form efes (Old English). The primary function of the eaves is to keep rain water off the walls and to prevent the ingress of water at the junction where the roof meets the wall. The eaves may also protect a pathway around the building from the rain, prevent erosion of the footings, and reduce splatter on the wall from rain as it hits the ground. The secondary function is to control solar penetration as a form of passive solar building design; the eaves overhang can be designed to adjust the building's solar gain to suit the local climate, the latitude and orientation of the building. The eaves overhang may also shelter openings to ventilate the roof space. Aesthetic, traditional or purely decorative considerations may prevail over the strictly functional requirements of the eaves. 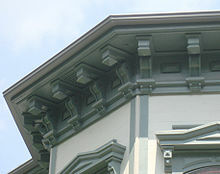 The Arts and Crafts Movement influenced the American Craftsman tradition, which has very wide eaves with decorative brackets, for which there is not necessarily a real functional need; likewise the Italian-style eaves, shown above. The eaves may terminate in a fascia, a board running the length of the eaves under the tiles or roof sheets to cap off and protect the exposed rafter ends and to provide grounds on which to fix gutters. At the gables the eaves may extend beyond the gable end wall by projecting the purlins and are usually capped off by bargeboards to protect the wall and the purlin ends. The underside of the eaves may be filled with a horizontal soffit fixed at right angles to the wall, the soffit may be decorative but it also has the function of sealing the gap between the rafters from vermin and weather. Eaves must be designed for local wind speeds as the overhang can significantly increase the wind loading on the roof. The line on the ground under the outer edge of the eaves is the eavesdrip, or dripline, and in typical building planning regulations defines the extent of the building and cannot oversail the property boundary. ^ a b Chisholm, Hugh (1911). Encyclopædia Britannica (Eleventh ed.). p. 840. Archived from the original on 17 March 2010. in architecture, the projecting edge of a sloping roof, which overhangs the face of the wall so as to throw off the water. ^ "Eave". Merriam-Webster Online. Merriam-Webster. Retrieved 20 June 2014. ^ External moisture – a guide to using the risk matrix (PDF). Department of Building and Housing New Zealand. 2005. p. 8. ^ "HOME CLINIC; Making Eaves Inspection a Routine". The New York Times. 26 November 2000. Retrieved 17 May 2011. ^ "Certain Home Shapes And Roofs Hold Up Best In Hurricane Says NJIT Professor". AZoBuild. 20 June 2007. Retrieved 17 May 2011.